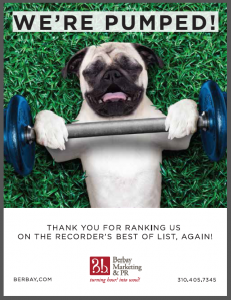 For the third consecutive year, Berbay Marketing & Public Relations has been named on The Recorder’s “Best Of 2015” list. Surveyed by thousands of legal professionals and readers, Berbay was selected among other firms for our services in the California legal industry. The Recorder is a leading provider of essential legal and technology news and information in California. For almost 20 years, Berbay has created the visibility and credibility that fuel revenue growth for law firms and professional service firms in the financial, real estate, A/E/C and B2B industries.